The theme of the event is "All Things Glorious." Speakers include Washington, DC Civil Rights Attorney and Community Activist Donald Temple, Esq., "The Social and Political Implications of Technology;" Howard University Assistant Professor of Sociology Bahiyyah Muhammed, Ph.D., "Does The Apple Fall Far From Prison?" 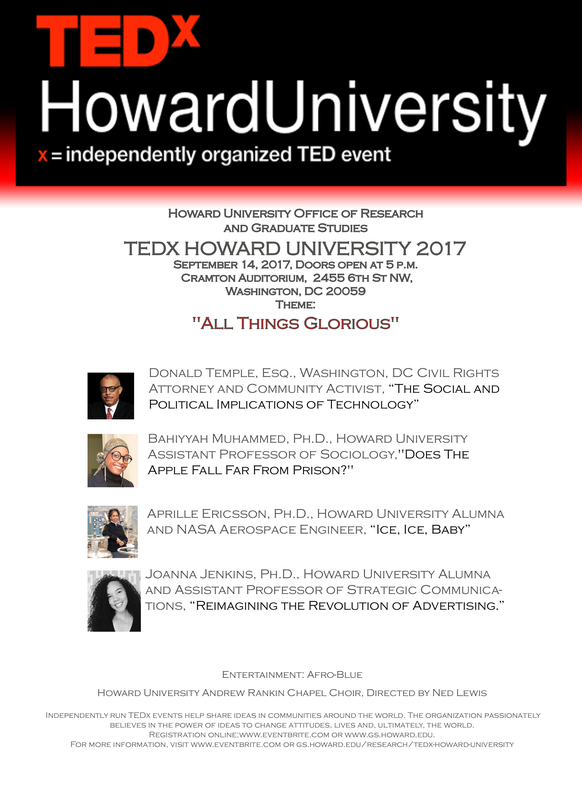 Howard University Alumna and NASA Aerospace Engineer Aprille Ericsson, Ph.D., "Ice, Ice, Baby," and Howard University Alumna Dr. Joanna L. Jenkins, an assistant professor of strategic communications at Howard University, "Reimagining the Revolution of Advertising." Entertainment will include performances by Afro-Blue; the Howard University Andrew Rankin Chapel Choir, directed by Ned Lewis. In the spirit of spreading new ideas, TED began in 1984 as a conference where technology, entertainment and design converged. Today, topics range from science to business to global issues - in more than 100 languages. Independently run TEDx events help share ideas in communities around the world. The organization passionately believes in the power of ideas to change attitudes, lives and, ultimately, the world. 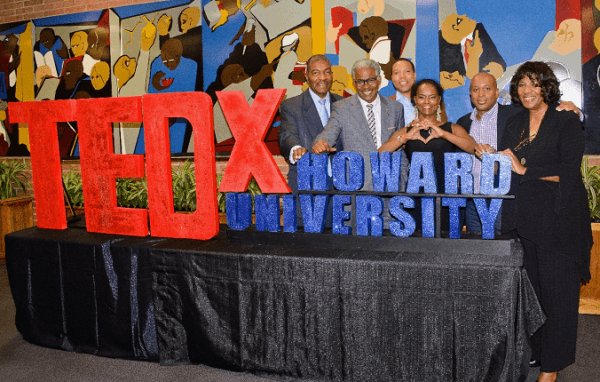 Established in January 2015, TEDxHowardUniversity is an independently organized platform to network, discuss and share with a multicultural, diverse audience "ideas worth spreading." The event also is an opportunity to share these ideas with a global audience of residents, scholars, and students of the Washington area's consortium of colleges and universities, including the Howard University community, as well as the international visitors to the nation's capital. Dr. Bahiyyah Muhammad is a professor of Criminology at Howard University whose research primarily focuses on the consequences of parental incarceration on children. Dr. Muhammad’s research has led her to conducting interviews with affected children and parents worldwide. She has spoken extensively on various national platforms and continues to share her expertise with both federal and state organizations. Dr. Muhammad is the founding director of the innovative Policing Inside-Out course, offered exclusively at Howard University, which addresses questions on race relations with minority communities and law enforcement. Dr. Aprille Ericsson is a proud Howard alumna and renowned aerospace engineer who has spent most of her career at the NASA Goddard Space Flight Center. Dr. Ericsson has lead and managed various successful instrument proposals and flight missions throughout her career and was named one of the “23 Most Powerful Women Engineers in the World” in 2015. She was the first woman to receive a Ph.D. in mechanical engineering from Howard University and the first female African-American to receive a Ph.D. in engineering at the NASA Goddard Space Flight Center. Donald M. Temple, Esq. received his BA from Howard University in 1975 and has practiced law since December 1978 when he worked in the U.S. Department of Housing and Urban Development. Mr. Temple started his private practice of law in 1990 in downtown Washington D.C. and is an aggressive advocate of what he calls civil and “silver rights”, successfully litigating against both corporations and government throughout his career. Mr. Temple has received numerous awards and commendations for his professional and educational work, and community service, including the National Bar Association’s Gertrude E. Rush Award, the Washington Bar Association’s Ollie Mae Cooper Award, and the National Black Law Student Association’s Cora T. Walker Award. Mr. Temple was recently inducted into both the District of Columbia and the Washington Bar Association’s Halls of Fame. Dr. Joanna L. Jenkins is an assistant professor at Howard University. A visual culture expert and creative director by trade, she has extensive professional experience within advertising, consumer engagement, strategic and visual communications. Within industry, Dr. Jenkins has led creative initiatives and worked with notable clients and agencies including Calvin Klein, Topps Inc., Verizon, Globalhue, Draft, and McCann. She has also created integrated communications campaigns in diverse media ranging from television, print, and radio to interactive, guerilla and digital. Her current research explores historical significance, ethics, and intersections among digital media, advertising, and culture. Some of her works include American Advertising Federation white papers on Millennial Perspectives on Diversity and Multiculturalism, Brands and Youth Engagement, and her book The Convergence Crisis: An impending Paradigm Shift in Advertising. Dr. Legand Burge, HU Computer Science Chair, and Dr. Grant Warner, HU professor and Director of Innovation and Entrepreneurship, address entrepreneurial aspects of recovery. The future of electronics via new quantum materials. Dr. Harris demonstrates prototypes of technology from the transistor radio to the iPod. Professor Greg Carr discusses the Africana practices of discovering and recovering knowledge.